Rated PG-13 for a sequence of violence and chaos. In St. Peter’s Field in Manchester, England, in 1819, an assembly of protesters urging parliamentary reform and workers’ rights was set upon by the British cavalry, who killed 18 and wounded nearly 1,000. The massacre, which came to be called Peterloo, can be seen as a foundational milestone of class struggle not just in England but all of Europe. According to reports, the great British filmmaker Mike Leigh has long sought to make a film about the events leading up to the massacre, and the massacre itself. I wish the long-gestating dream had resulted in a better film. 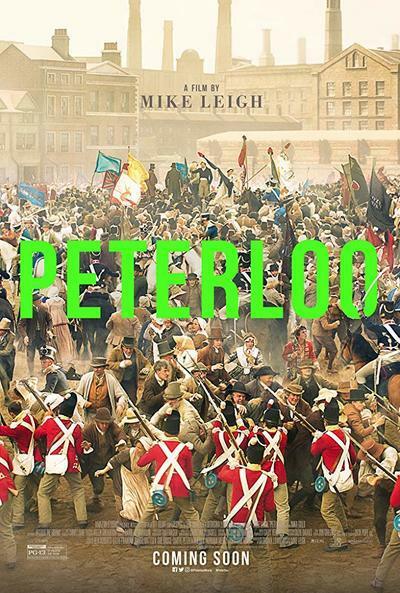 I don’t want to read too much into things that I only know second or third hand, but in a sense “Peterloo” shows the pitfalls of the dream project. In 1819, the theories that went on to animate class struggle and radically change the world were in an inchoate state. Friedrich Engels was not even born yet, and Karl Marx was just a baby. So “Peterloo” takes a special interest in two factors; the pre-Industrial-Revolution conditions for workers that enraged the laborers and moved the thinkers of the higher classes, and the organization of protest, which necessarily had a hand in raising the consciousness of the oppressed classes. Leigh’s ambition, then, is to forge an epic about the powerless rather than the powerful. It chronicles the efforts of journalists, working men, and factions of the enlightened upper class to campaign for living wages and representation in the North of England, where industrialization was coming into its own and creating, among other things, new ways to exploit and alienate human labor. But his efforts to chronicle and truthfully represent the evolution of thought in this time leads him to pack his dialogue with grandstanding, on-the-nose clichés. Howard Hawks once famously explained his problem with making his ancient-era epic “Land of the Pharaohs” credible with the observation that he and screenwriter William Faulkner “didn’t know how a Pharaoh talked.” Leigh has plenty of documentation about how the people in this story thought, and wrote, and he fills their mouths with ideas and indignations. But there’s little convincing sense of how conversation in 1819 went on. This may not be the result of Leigh’s not knowing better as it is his determination to cover all the ground he feels he needs to. Leigh’s passion for the material seems to have led him to approach it from an angle more pedagogic than artistic. But things don’t improve when he lets loose a little. The evil magistrates of the region who conspire against the protesters are portrayed, along with a couple of British royals, with a cartoonish disdain that feels very Ken Russell. When these baddies suspend habeas corpus, there’s an earnest discussion of the term itself in a newspaper office, with editors furrowing their brows over how to explain the term to an uneducated readership. One suspects Leigh might have had similar concerns, but his way of addressing them come off as, yes, condescending.